NFL referee Sarah Thomas during the fourth quarter between the San Francisco 49ers and the New England Patriots at Levi's Stadium in this Nov. 20, 2016, file photo. Sarah Thomas is single-handedly trying to tear down the glass ceiling. 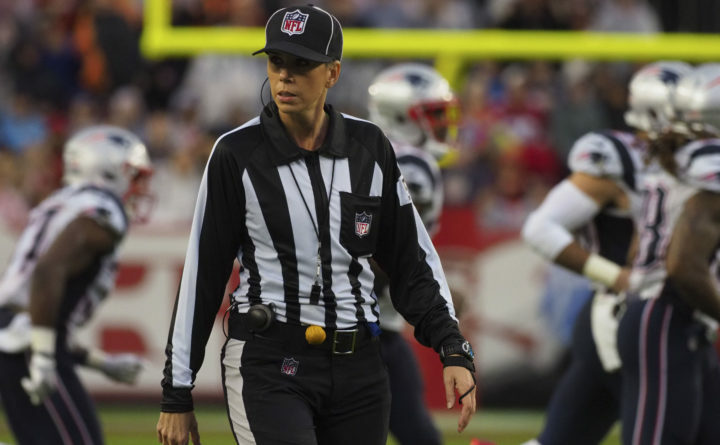 After making history in 2015 by becoming the first full-time female official in NFL history, Thomas will become the first female referee to officiate a playoff game in league history on Sunday when she takes the field for the New England Patriots-Los Angeles Chargers AFC Divisional Round game at Gillette Stadium, according to reports from Cameron Filipe of Football Zebras. Back in 2017, Thomas was an alternate for the Atlanta Falcons-Los Angeles Rams’ wild-card game but never took the field. She’s spent the last two seasons as a down judge, before previously working as a line judge. Thomas is in her fourth season as an NFL official. And in another move for equality, Terri Valentini, the NFL’s first female instant replay official, is scheduled to work the Indianapolis Colts-Kansas City Chiefs Divisional matchup on Saturday in Kansas City. The moves come on the heels of the of the NBA announcing that referees Ashley Moyer-Gleich and Natalie Sago would be promoted to full-time status back in November, becoming the fourth and fifth women in league history to reach that level. In 1997, Dee Kantner and Violet Palmer became the first two female full-time NBA officials in league history. Lauren Holtkamp became the NBA’s third full-time female official in 2014 and is still active.